Whether you embrace your locks' natural hue or color-treat them, there's always room for more vibrance and shine. But don't rely on a fumy, bottled enhancer for results. Instead, restore your shade with nourishing foods from the pantry. Julie Gabriel, author of "The Green Beauty Guide ," developed these temporary color-intensifying glosses for blondes, redheads, and brunettes. "You'll get similar effects to using store-bought products, but without the fragrances, dyes, or chemicals," she says. All it takes is a few minutes once a week -- and a few key ingredients. Cocoa makes for a deeper, richer brown. What to do: Whisk ingredients into a paste. Shampoo hair, squeeze out the water, and apply the mask. Keep it on for 2 to 3 minutes. Drape a towel around your neck to prevent the mask from dripping, as it may stain skin temporarily. Rinse, then style as usual. 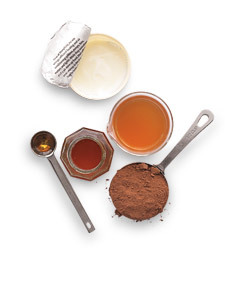 How it works: Honey moisturizes while acids in the yogurt (lactic) and vinegar (acetic) penetrate the hair shaft, allowing the cocoa's pigment to sink in. "Natural acids open the cellular doors to the pigmented molecules and make the results more pronounced," Gabriel says. 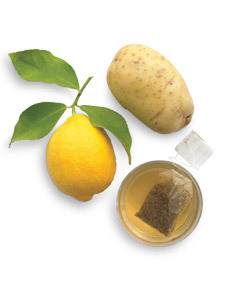 Tea, lemon, and potato enhance sunny shades. What to do: Squeeze the juice from the lemon. Grate the potato and blend with the lemon to form a paste. Add the tea and stir. Shampoo, then spread the mask throughout hair, massaging lightly. Cover your head with a PVC-free shower cap or plastic wrap, then lightly heat with a hair dryer for 2 to 3 minutes. Rinse, then style as usual. How it works: The chamomile and lemon act as whitening agents, and the acidic lemon juice allows potato enzymes -- which help brighten blonde hair -- to break through the tough, keratinized outer layer of the hair. Carrots and berries boost red locks. 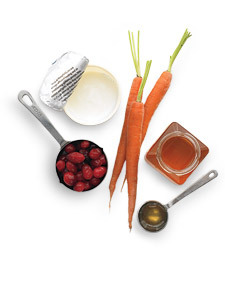 What to do: Finely chop raw carrots in a food processor or blender, add cranberries if using, and make a coarse paste. Add yogurt and honey, then mix well. Shampoo, then spread the mask throughout hair, massaging lightly. Keep it on for 1 to 2 minutes and rinse. Style as usual. How it works: The yogurt's lactic acid helps the coloring antioxidants in the berries and carrots get past the surface of your locks -- so they really seep in. Honey, a natural humectant, hydrates the hair.